Over the past 10+ years of this gold and silver bull, I’ve seen gold and silver “newbies” repeatedly make the same mistakes. So I’ve decided to write this short article to help people more clearly understand gold and silver price behavior. There are 3 solid rules to follow and understand when buying gold and silver bullion and or mining stocks. Because of the lack of understanding of these rules, many investors unfortunately unload gold and silver assets at the exact wrong time, at the bottom of long corrections and right at the beginning of huge new legs higher. Back in mid-May, when I wrote that it was a very low-risk, high-reward point to buy gold and silver assets, virtually no one outside of the very small circle of seasoned gold and silver investors were interested. Now that gold and silver have risen considerably since that point and time, there is more interest than just a few weeks ago, but again, some newbies will make the mistake of buying into gold and silver now, and on any slight pull back, listen to the doubts disseminated by the mainstream media, and panic sell again. I previously stated on August 16, 2012, the following: “The one thing I can guarantee, however, is that when gold and silver finally make new highs, and they will, some of the ferocious moves higher are absolutely going to stun a lot of people.” And I still stand by this statement. In retrospect, I don’t consider the recent moves in gold and silver to be part of the “ferocious moves higher”. That hasn’t happened yet and we’re still a bit away from the manifestation of the scenario that will trigger these moves. Still, some of the moves higher in gold and silver that will happen over the next 1-2 years will be so rapid and shocking that to most people, they will seem impossible given the psychological damage done by the past 18-month gold & silver correction and consolidation period. And to those that pay too much attention to the mainstream financial press and not enough to the realities of the physical, not paper, gold and silver markets, these violent moves higher will be likewise shocking. Because gold and silver have been so suppressed for an extended period of time the consequent defensive actions of exiting PM mining stocks and re-purchasing them at solid re-entry points has left many gold and silver investors weary and with a negative outlook ahead. Though patience is a virtue when holding and stacking gold and silver assets, this virtue is much more easily vowed than practiced, especially during volatile periods of price behavior upward and downward during an extended consolidation phase. (1) Volatility Does Not Equal Risk. Far from it. In fact most volatility in gold and silver is deliberately manufactured by the banking cartel, and is manufactured in fake paper derivative markets in which prices are set with absolutely zero regard for the actual physical supply and physical demand determinants of these two precious metals. Furthermore, since banker cartel manipulation of paper gold and silver derivatives plays such a big role in price volatility, moves in gold and silver are often just as violent to the upside as they are to the downside after long periods of consolidation, as violent moves higher are often caused by short-covering of panicked hedge funds and banking cartel members that are forced to unwind shorts when the momentum to the upside becomes too great for them to suppress. Furthermore, after brief periods of very quick rises, another short-term correction triggered by day traders taking profits and/or desperate banking cartel members actions in paper markets does not mean the uptrend has reversed back downward again…which bring us to Rule #2. 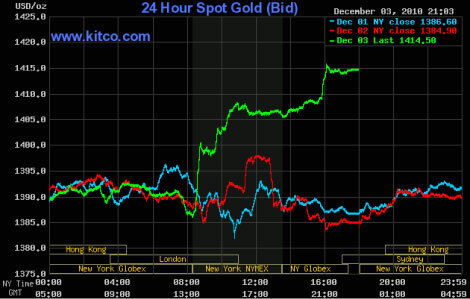 (2) Lack of Patience is the Greatest Enemy to Buyers of Gold, Silver and PM Mining Shares. With physical gold and physical silver, bankers deliberately create massive volatility in paper prices at times to discourage the uninitiated from buying physical and to try to goad those already in to mistakenly sell. With PM mining shares, the greatest mistake investors make with this asset class is to let the bankster created artificial volatility in mining shares discourage them into selling out of all of their shares right before the next great leg higher. While it is true that the vast majority of gold and silver mining shares in the junior resource sector are junk and inflated pipe dreams, even cashed-up, solid junior mining companies will be taken down in price during bankster raids on paper gold and paper silver and thus, patience with junior mining companies is essential to coming out on top. One of the top performing gold stocks lost more than 50% of its value a few years before the onset of the Great Depression before going on a spectacular +1,258% run higher that ended in1939. Those that were impatient because they were unable to see the big picture of the importance of gold during periods of severe economic instability sold out when this stock corrected sharply, locked in losses, and received none of the spectacular gains. Many today will repeat this same exact mistake. (3) Ignore the White Noise and Disinformation Anti-Gold/Anti-Silver Campaigns of the Commercial Banking Industry. Clients that allocate money to physical gold and physical silver purchases or PM mining share purchases translates into lost revenues for fee-based managed money commercial banking and brokerage firms because this normally translates into money that leaves these firms and never comes back. Thus, the vast majority of commercial banking/brokerage firm employees have great incentive to prevent their clients from purchasing any gold and silver assets of any nature, including even robust PM mining stocks. Thus, when the most robust PM mining shares are at super undervalued valuations and represent a low-risk, high-reward set-up, commercial banking/brokerage firm employees are likely to tell you there is ZERO opportunity in PM mining shares. However, when great runs higher in gold and silver assets occur, uninformed commercial banking employees are likely to inform you of this situation and goad you into purchases right before the next steep correction, as was the case when silver hit $50 an ounce last year. A sharp, rapid and significant correction in the first month of buying gold and silver is a lesson likely to keep many “newbies” from ever returning to the gold and silver markets in the future.